Horseware Mio Fly Rug-Bronze/Navy 6'3"
Along with the warmer weather comes an unstoppable swarm of midges and flies. And horses in particular can find these little pests extremely irksome. Many horse owners swear by fly rugs (or 'fly sheets' as they're sometimes called) for protecting their horses from flies. They have the added benefit of providing protection from the sun's rays. Flies and hot sun are a certain recipe for irritation so your horse will be extremely grateful for his new, lightweight rug. A fly rug's primary function is to keep the bugs at bay. Insect bites can be extremely bothersome for horses and can cause itchy bumps on their skin. What's more, irritating insects will cause some horses to stamp their hooves and become increasingly agitated, and it's hard for loving owners to watch their horses becoming so upset. Too much exposure to the sun can result in a sun-bleached coat and isn't great for your horse's health, either. Those whose horses compete in shows will be especially keen to protect that shiny coat and keep it in pristine condition. Aside from keeping their coat protected, some horses have extremely sensitive skin that can be prone to burning in the sun. A fly sheet is a great way to keep them cool and avoid painful sunburn. Fly rugs also double up as a handy protective layer, especially when you're travelling to shows. Dust and airborne dirt won't be an issue and your horse will enjoy the soft, lightweight nature of a fly rug while they're in transit. Most designs are very durable, so should last you through a couple of seasons at least. Look out for fly rugs that are constructed from ripstop fabric so that any small tears don't get out of hand. Most designs will feature two straps underneath to keep the fly rug in place. Some owners advise designs that have three straps for added security and there are designs which feature crossover belly straps. Those rugs won't go anywhere in a hurry! 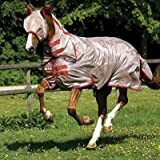 If your horse is really suffering with the beasties, look for fly rugs which feature neck, ear and tail covers as these offer additional protection for which he'll be very grateful. 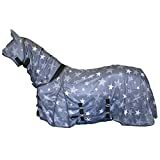 You should also search for a fly rug which offers UV protection so that your horse's coat is protected from harmful rays. Most fly rug designs will be available in a variety of colours, which is great if you intend it to be part of your show kit. The fabric should be a mesh design to allow for breathability and comfort. 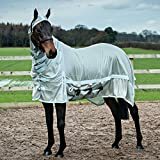 If you spend around £25, you can get a good quality fly rug that offers full-body coverage, but probably won't have those little extras such as neckpieces and fly masks. But if you spend closer to £35-£40 you will benefit from extra features such as tail flaps, fixed neck and surcingles.